Kritsa ( Κριτσά ) is one of the oldest and most charming villages in Crete. This village is located in the municipality of Agios Nikolaos . It is just over 10 km from the city. With around 1,600 inhabitants (as of 2001), it is one of the largest villages in Crete. Kritsa, surrounded by olive groves, is located on the eastern slope of the Castello (Kastello) at an altitude of about 375 meters above sea level. Currently, the village area is divided into four districts called Palemilos, Koukistres, Christos and Pergiolikia. The history of this town probably dates back to the second millennium BC. In Minoan times it was known mainly for goat meat of particularly high quality. The name of this village, according to some historians, is derived from the word kreas (κρεας), which in Greek means meat . This village is connected with the tragic story of a young girl named Rhodanthe who was kidnapped from home by a drunken Turkish officer. This man, charmed by her beautiful singing, decided to marry her. On his way, however, was the mother of the girl who strongly opposed this proposal. So the officer decided to take the woman by force. The woman abducted to Turk's house did not think to marry him, so when the drunken man slept, Rhodanthe took his knife and cut his throat, then cut her hair with it. Knowing that after such an act she would not be able to return to her family home, she decided to join the guerrillas hiding in the mountains, dressing up as a young man. Since then, she was known as Kritsotopoula (Kritsy's Child). In 1823, she took part in a two-day battle taking place in the valley between Kritsa and Lato . In this encounter she was shot deadly in the chest. Comrades of arms, who tried to save the wounded Kritsotopou, discovered a mystery hidden by him (her) under his clothing. At present, the memory of this heroine is still alive in Kritsa, and it is evidenced by the fact that the main street that climbs up the village is called: Kritsotopoula . Kritsa is one of the most charming villages in Crete, but to appreciate its true charms you have to leave the main streets. Deepening between dense buildings, you will discover many narrow streets whose width allows you to move freely only to scooters. Finally, we recommend visiting several stores selling local products. By the way, you can come across the Nostimon store, where you will be warmly welcomed by a Polish woman who has been living in Kritsa for several years. 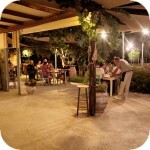 Kritsa is situated between many olive groves and is of course famous for its olive oil. It is a product with one of the smallest amounts of acids contained in it. This property constitutes a particularly high quality of the oil that comes from that which was awarded at many fairs. We also recommend honey honey crayfish from local products, available at the Ewa Nostimon store. In several places you can also buy jewelry, leather accessories and footwear that are produced by craftsmen living in Kritsa. A view of Kritsa and the surrounding hills.